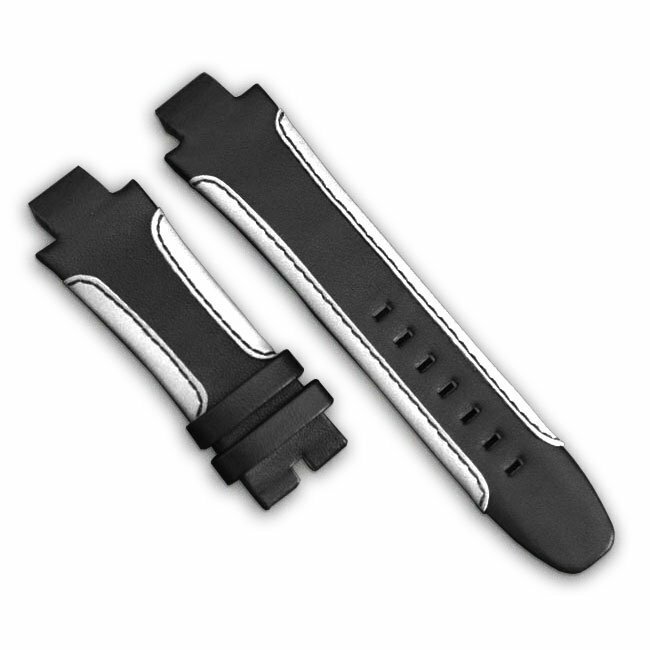 High-grade Alcantara black and white luxury leather watch bracelet. This is a fantastic addition to most Wryst timepieces with case size 45mm (Except Ultimate collection). Enhance the look of your exclusive limited edition Swiss sports watch Wryst with one of the strongest leather available to date. Originally dedicated to fit the yellow gold Wryst Shoreline LX6 or the black DLC Wryst Motors MS2, this quality leather bracelet is now offered with the Wryst Motors MS3. With carbon fiber details on the dial, the black, MS3 with red details it the ultimate motorsport watch. Note this band has been chosen by buyers of the Isle of Man TT special edition back in 2015 and 2016. The luxurious leather watch bracelet Wryst design is original and totally unique. Both sides of the band have white leather lines stitched in black for a look never seen before. Built to be highly resistant the bracelets are firmly attached between the watch head lugs with a solid insert and an "exclusive to Wryst" set of screws. The purpose of this luxury addition is to increase even more the suave and luxury feel of your watch. Buckles can be purchased separately.